There is a twofold aspect to the will of God. And there is the disparity between the decretive and preceptive will, between the determinations of his secret counsel that certain events will come to pass and the prescriptions of his revealed will to us that we do not bring these events to pass. It cannot be gainsaid that God decretively wills what he preceptively forbids and decrectively forbids what he preceptively commands. It is precisely in this consideration that the doctrine of God’s sovereignty is focused most acutely with demands for our faith and reverence. If I am not mistaken it is at this point that the sovereignty of God makes the human mind reel as it does nowhere else in connection with this topic. It should be so. It is the sanctified understanding that reels. And it is not the mark of intelligence to allege or claim a ready resolution of the apparent contradiction with which it confronts us. How can God say: This comes to pass by my infallible foreordination and providence, and also say to us: This thou shalt not bring to pass? Comm. ad Ezekiel 18:23; E.T. by Thomas Myers. It is more probable that the Latin verb velle, translated on three occasions above by the English term ‘wishes’, should rather be rendered ‘wills’. The present writer [Murray] is not persuaded that we may speak of God’s will as ‘simple’, after the pattern of Calvin’s statement. There is the undeniable fact that, in regard to sin, God decretively wills what he preceptively does not will. There is the contradiction. We must maintain that it is perfectly consistent with God’s perfection that this contradiction should obtain. But it does not appear to be any resolution to say that God’s will is ‘simple’, even in the sense of the Latin term simplex. The crux of the question as it is posed for us by the theory of evolution is: can the portrayal given us in the Bible, and particularly in Genesis 1 and 2, be interpreted as compatible with a theory that man as we know him and, for that matter, man as represented in Genesis, came to be by a process of evolution from lower forms of animate life? It matters not which particular form of evolutionary theory is in view, and it would be extraneous to this study to deal with the various evolutionary theories, even with those of most recent vintage. The issue is the same. As applied to man, is an evolutionary view of his origin compatible with the biblical representation? There are several considerations that demand a negative answer. 1. Man’s identity consists in the image and likeness of God. This is man’s differentia from the beginning (Ges. 1:26; 5:1; cf. 9:6); he was made in this image and likeness and therefore cannot be conceived of on any lower level. When we ponder the stupendous import of this characterization and of the implications for the cleavage between man and all other orders of being in this world, then we are compelled to conclude that no actions or processes such as would account for other forms of life would be sufficient for the order to which man belongs. It is only when we fail to assess the significance of the image and likeness of God that we could offer entertainment to a theory that posits continuity with other orders or species of animate life in this world. In other words, to suppose that a process of evolution by forces resident in an order of things incalculably lower in the scale of being could account for man’s origin, involves an incongruity once we appreciate the identity of likeness to God. 2. Genesis 2:7 cannot be reconciled with the evolutionary hypothesis, and it confirms the conclusions derived from Genesis 1:26; 5:1; 9:6. It was by ab extra impartration, communication from God described as inbreathing, that man became animate creature as well as man in his specific identity. In no respect, therefore, could man be regarded as animate being by evolutionary process. The postulate of evolutionary theory is to the opposite effect. It must maintain that the ancestors of homo-sapiens were animate. So in the one text which delineates for us the mode of God’s action in making man there is explicit contradiction of the evolutionary postulate. From this contradiction there is no escape, unless we do violence to the elementary requirements of biblical interpretation. 3. Genesis 2:7, as we found, shows man has affinity with the material stuff of the earth, and with the animate creation as well. There is likeness and for that reason congruity. So we should expect resemblances of various kinds. If there were complete disparity, how incongruous would be man’s habitat and vocation. We see the wisdom and goodness of the Creator in these likenesses. No evolutionary hypothesis is necessary to explain them; they are required by the relationship man sustains to his environment. Do you despise the riches of His goodness, forbearance, and longsuffering? John Murray’s commentary on Romans is a rare treat. Murray’s commentary was faithful to the Scottish Reformed tradition in which he was raised. It was also a continuation of the great works in the Old Princeton tradition of theologians who were master exegetes. 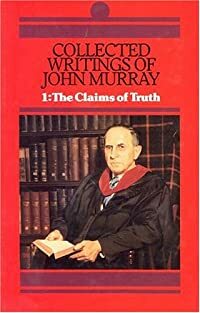 There is much in the work that is valuable on the subject of the free offer but Murray’s comments on Romans 2:4 “Or do you despise the riches of His goodness, forbearance, and longsuffering, not knowing that the goodness of God leads you to repentance?” are particularly pertinent. Of course included in the outward “gifts of covenant privilege” is the free offer of the gospel and the spirit of Rom 2:4 should animate the free offer.